I was watching a reality show recently (I think it was 19 Kids and Counting. Yes. I watch that. Don’t judge.) when someone was talking about their small children. They said something like, “I tell my kids that they are best friends. And then they usually act that way.” I think that’s such a great way to approach the relationship between my kids. I’ve reminded them they they need to take care of each other and told them how lucky they are that they have each other to play with. And now they’re living it. 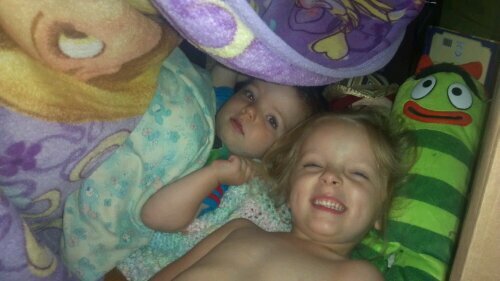 Hanging out in their fort. Later in the morning, we went downstairs to put the dogs away and get some clothes for Devon. (Do we get points for having clean clothes, even if they’re not put away??) I discovered quite a mess in the dog’s room, so I had the kids wait in the family room while I cleaned it up. In the midst of the grossness, I heard giggling from the family room and then Chloe said, “Give me your arm buddy.” When I emerged from the grossness, I found a mismatched, backwards shorts boy – dressed by his sister – and both kids were smiling and happy. Chloe got big hugs and Devon left the house with his shorts on backwards. As they get older and make friends in school and develop other interests, I’m sure their relationship will change. But hopefully they’ll always remember that they can count on each other – and that they are best friends. I’m in a funk. I know I’m in a funk, but I just can’t shake it. There are a lot of great things in my life, but I keep getting hung up on the not-so-great, big and little. Chloe clears her plate from the table when she’s done eating, usually without me asking, and Devon is following in her footsteps. But I find myself fixated on the crumbs they’re spilling on the floor when they do it. Devon’s vocabulary has grown by leaps and bounds in the last few weeks, but I’m stuck on the fact that he still screams and grunts a lot and isn’t talking as much as Chloe was at this age. I’m tired of my house being a mess all the time, but I haven’t done anything to change it – like actually work on cleaning after the kids are in bed instead of just relaxing. Ugh. So what does the rational you do to get the irrational you out of a funk?